Barry Windsor-Smith, Marvel Comics Presents #79. As a result of the adamantium bonding, Logan’s brutish impulses have become increasingly exaggerated. In an attempt to “reprogram” Logan into a controllable weapon, Dr. Cornelius sets up an elaborate audio-visual network that allows one to control Logan’s actions with the use of a microphone. As the Professor tests the system, an overload reverses the flow of information, and Logan’s hallucinatory thoughts appear onscreen. As a deformed spiked-filled skeleton, Logan screams in agony and disbelief at his experimentation. Logan then stirs from the table and grabs Carol Hines, while making his way towards the Professor. Guards quickly tranquilize Logan before anyone gets seriously injured, but the Professor is furious, raging on about the dangerous nature of the experiment. As everyone turns to leave the laboratory, the overhead screen projects Logan’s subconscious impulse, savagely killing the Professor with his new claws. Logan is led outside in the bitter cold to a snowy field in the Canadian wilderness. Drenching him in sheep’s blood and wiring him for biological data, the Experiment X handlers release three starving and feral wolves into the fields. Moments after the wolves swarm over him, Logan’s vitals spike, reaching beyond human levels, and Logan savagely shreds the wolves to pieces. The experiment successful, the Professor dubs Logan “Weapon X”. X-23, a female genetic twin created from Logan’s DNA, is run through the same training as Logan did during Experiment X. Her first test is to face three starving and feral wolves, her progress matched against a hologram of Logan’s performance. At the Professor’s urging, Dr. Cornelius grafts additional wiring, implants and antennae into Logan’s body, giving greater control over every bit of Weapon X’s movements. And when the power supply is shut down, Logan simply ceases to function as a human being, sitting as still as a piece of dead meat. Fantomax tells Wolverine that, “As Weapon X, you spent the best years of your life being tortured in the project laboratories.” In other words, Logan was subjected to testing over a course of several years. 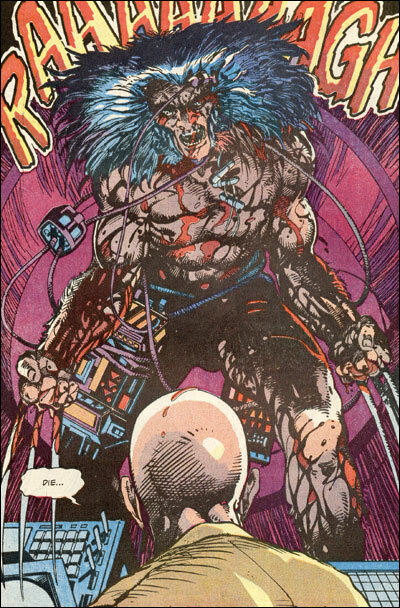 Logan seemingly suffers a life-threatening injury during his time at Experiment X as he is forced to confront and defeat Lazaer, the Angel of Death, to save his soul. Wolverine faces all of the incarnations of himself who have defeated Lazaer, including when he was the subject of Experiment X.
Wolverine again remembers fighting and defeating Lazaer during his time at Experiment X. In Genosha, Logan comments, “I’ve been a slave. Didn’t care much for it.” This is probably in reference to his memories of Experiment X. After reading his file in the Weapon Plus database, Logan reveals to Jean Grey that Experiment X “…made me into a Sentinel… part-man, part-metal, brainwashed and trained to murder my own people. They chose me because I like to kill.” This seems to imply that Logan believes he was trained to hunt down and kill other mutants. Logan further believes that his vague memories as James Howlett might be memory implants from Experiment X to keep him under control. One hundred years in the future, Logan suddenly remembers being under the control of Experiment X programmers by means of a cerebral biotic implant. As with all stories that take place in the future, we cannot rely upon their accuracy. The Director of the newly rejuvenated Weapon X program informs Logan that when his team went to the site of the original Experiment X, they retrieved codes for Logan’s mental implants that the original program used to control him. They were still functioning allowing the Director to use Logan to kill a U.S. Senator without his knowledge. Wolverine has a nightmare of walking through the town of Roanoke and attacking a young boy with his claws. 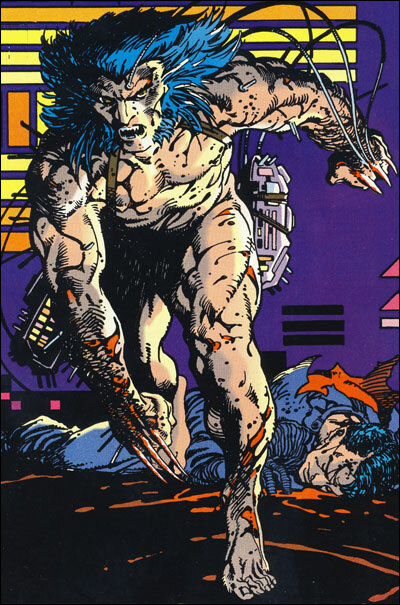 Under the control of the Weapon X program, Logan massacres 116 people from the town of Roanoke. As the Professor relates to Dr. Cornelius, “This experiment was necessary… Imagine being able to drop Weapon X or somebody like him into the cities of our greatest enemies when the need arises with zero risk to our troops.” To cover up the massacre, the Experiment X soldiers burn the town to the ground, destroying all evidence and leaving behind a plausible cover story. In order to judge the status of Weapon X, the Professor and Dr. Cornelius begin an elaborate virtual reality ruse to test Logan’s reactions to extreme situations. In addition to the existing wiring and implants, heavy batteries and virtual reality helmet are attached to Logan’s body. Within the context of the test, Logan is confronted by a ferocious bear, a creature that he quickly disposes of with his claws. As Logan is returned to his cell, he savagely kills one of his handlers and escapes into the main facility. Professor Xavier and Jean Grey mind-probe Logan’s memories to assist him remembering his past. 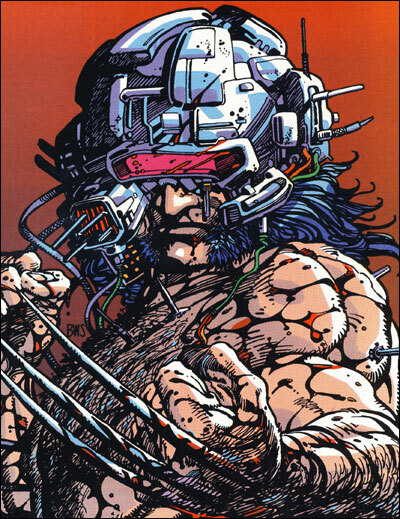 In a flash, Logan remembers being tested during Experiment X. Logan is wearing goggles and remembers being exposed to a series of threats such as a ferocious bear, an army of soldiers, and psychological anguish. X-23’s training continues to stage two where she faces a ferocious bear, with her progress again matched against a hologram of Logan’s performance. In a story that takes place in 1981, Professor Charles Xavier helps Wolverine to remember his past, specifically killing a bear and escaping into the Experiment X facility. As the test continues, the Professor’s mysterious superiors take control of Weapon X and let him loose within the complex. Logan systematically makes his way across the facility towards where the Professor is working, killing at least six guards on the way. It appears that Logan’s uncanny tracking abilities are responsible, for he is able to tear up through the floor of the room that the Professor is in, cutting off the Professor’s hand upon arrival. When Logan walks through the Alberta, Canada location of Experiment X, he spontaneously remembers breaking free of the Experiment’s control and making his way through the crawlspace to reach the Professor in his control room. Twenty guards burst into the room and swarm over Weapon X, giving the Professor sufficient time to escape down the corridor. As Dr. Cornelius and Carol Hines attend to the Professor’s bleeding stump, Weapon X methodically disposes of the guards. In a panic, the Professor, Dr. Cornelius and Hines lock themselves in the adamantium reactor, preparing for the final showdown with Logan. The Professor tries to contact his superiors for help as Dr. Cornelius readies an assault rifle, but both are interrupted by Weapon X, drenched in blood, tearing through the reinforced walls, his claws ready for attack. Barry Windsor-Smith, Marvel Comics Presents #81. As Weapon X advances on them, Dr. Cornelius unloads his assault rifle into Logan, dropping him in a heap. Dr. Cornelius then moves forward to check on the body, but Logan springs to life and disembowels the Doctor with one swipe of his claws. The Professor and Carol Hines quickly flee further into the reactor, reaching the core itself. The Professor then ruthlessly knocks Carol into the central core as bait for the oncoming Weapon X.
Logan begins to gain awareness as he reaches Carol Hines, and as she warns him that the Professor plans to release the molten adamantium core to stop him, the Professor does just that. Severely burned, Logan breaks through the window of the central core control room and attacks the Professor. With his sanity intact, Logan verbally berates the Professor and severs the Professors remaining hand, before finally popping his claws through the Professor’s skull. Wolverine again remembers attacking the Professor in a burst of rage. In a story that takes place in 1981, Professor Charles Xavier continues to help Wolverine to remember his past, conjuring up memories of when Logan attacked the Professor, a group of guards and Dr. Cornelius. His final recollection is that of surviving the molten core and attacking the Professor one final time. Logan heaves the Professor’s lifeless body through the window of the control room and into the fiery molten core, before collapsing from exhaustion and injuries. When he awakes, Logan has no memory of his actions, but does find the Professor’s severed hand and the dead body of Dr. Cornelius. As his claws unwittingly pop from the back of his hands, he slowly begins to realize the he was responsible for the mayhem, and begins to lose his sanity. Sprinting outside, Logan tears through a chain link fence and finds himself face-to-face with a Siberian tiger. Logan and the tiger leap at each other, but Logan quickly guts the tiger with his claws. As Logan stands over his defeated foe, the Experiment X wranglers approach to return Logan to his cell. All of Logan’s experiences since the addition of his virtual reality helmet and his confrontation with the bear had been a part of an elaborate experiment to test his actions and capabilities in the environment of free will. As the Professor and Dr. Cornelius congratulate each other on a successful test, Logan kills his two handlers and enters the complex. Within minutes he locates the Experiment X control room and tears through the reinforced security door, coming face-to-face with the Professor, Dr. Cornelius and Carol Hines. Cajun mutant and thief Remy LeBeau breaks into Experiment X to steal back the diary of Nathaniel Essex. Along the way, he discovers three isolation tanks with unknown individuals floating inside. Just as he is discovered, Logan breaks free, giving Remy an opportunity to escape unnoticed. The identities of the individuals in the tanks are still unknown, though it is probable that one is the Native who we will meet in the next chapter of this chronology. Wolverine, having regained his memories after the events of House of M, enters the Department K facilities in Canada. It seems that the Experiment X facility has been taken over by Department K, a Canadian military research group focused on Experiment X. Wolverine begins to have flashes of memories of his time at Experiment X, including his escape. As Wolverine examines the grounds, he comes to the shocking conclusion that he had help escaping Experiment X. It is strongly suggested that the help came from the Winter Soldier, Bucky Barnes. Professor Xavier and Jean Grey mind-probe Logan’s memories to assist him remembering his past. In a flash, Logan remembers slashing his way through the guards of Experiment X. The fact that the Professor is still alive but missing his right hand suggests that Logan did cut off the Professor’s right hand in real-life, but did not kill him in the confrontation at the end of Experiment X. After the confrontation in the control room, Dr. Cornelius and Carol Hines discuss Experiment X. Based on their sympathy for Logan, one assumes the two of them were unharmed during the attack that left the Professor maimed. Emma Frost reveals to Dum-Dum Dugan, acting head of SHIELD, that Wolverine has recovered all of his memories in the aftermath of the House of M storyline. This precipitates the destruction of all evidence of the Weapon X program by the United States, Canadian, Russian, and British militaries, suggesting that these governments were aware of and possibly complicit in Experiment X.
Heather McDonald, accessing the Canadian Government Computer Database for Logan, comes across an entry for Dr. Monica Hines, who wrote a major paper on immunology. It seems that Carol Hines may have gone to graduate school after Experiment X as Monica, doing research on the effect of complex metallic salts on the immune system and tissue regeneration, specifically researching adamantium. As noted previously, Marc Cerasini’s Wolverine: Weapon X (a prose novel from Marvel Press) is an exploration of the Weapon X storyline by Barry Windsor-Smith. Marc Cerasini claims in an interview with UnderGroundOnline, “Marvel also provided a really amazing timeline/bible for the character Logan/Wolverine which I used heavily. There are some real secrets in that document and I revealed a few of them in the novel.” Due to significant problems with the novel’s chronology, including the deaths of major characters who survived Experiment X in the original Barry Windsor Smith version, I have deemed that Wolverine: Weapon X by Marc Cerasini does not take place within the traditional Marvel continuity. However, I include the following revelations from this novel for the sake of completeness, presenting that information in red. A creature claiming to be the demon Ba’al from biblical times seems to recognize Wolverine as a reincarnation of the Hand of God, a sacred warrior who had defeated him in ages past. Barry Windsor-Smith, Marvel Comics Presents #80.